Brenda Gervais from With Thy Needle & Thread. 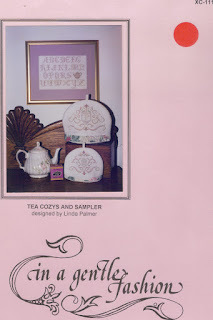 That link goes to Brenda's blog of the same name while this one Country Stitches Online goes to her shop which sells her own line of charts plus those from other designers too. 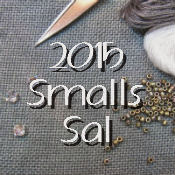 She also sells charms, fabric, ribbons and other embellishments. stitched over 1 on 32 count Star Sapphire linen. I changed the fabric to this pale blue which necessitated changing most of the colours too. I even changed the bluebirds to red cardinals because I do love the pop of their red. I used all DMC threads too. Yes, I would. Because I am a sucker for seasonal series! At this rate I will finish the whole series in 2025 which is fine. They are quite quick projects so will be ideal for my "25 in '25" challenge! Both these charts were gifts. Jenny sent me the first one which I really enjoyed stitching so when Shirlee offered her chart in a giveaway I threw my name into the hat and was lucky enough to win it. Brenda has a primitive style, whole stitches only, very little backstitch. She is not a well-known designer in the UK. 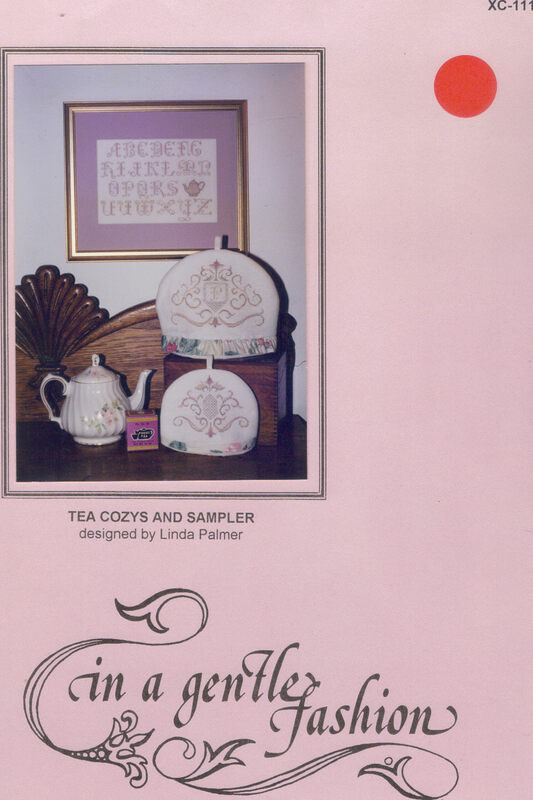 I couldn't even find her charts on the SewandSo website (unless they are hidden in the Other Designers category) but I did discover that Patchwork Rabbit stock them so I will be able to puchase the rest of the Wordplay series. 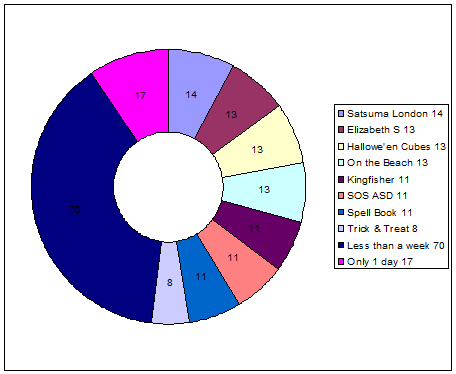 There are several Hallowe'en themed charts on the WTN&T website which are rather tempting too. Her blog is always very interesting. She talks about the design process, showing her floss tosses and discusses the issues around colour. 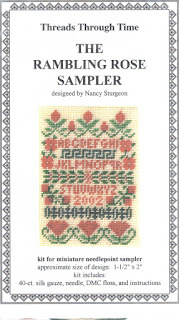 She also charts reproduction samplers and shares some of the history of the pieces. 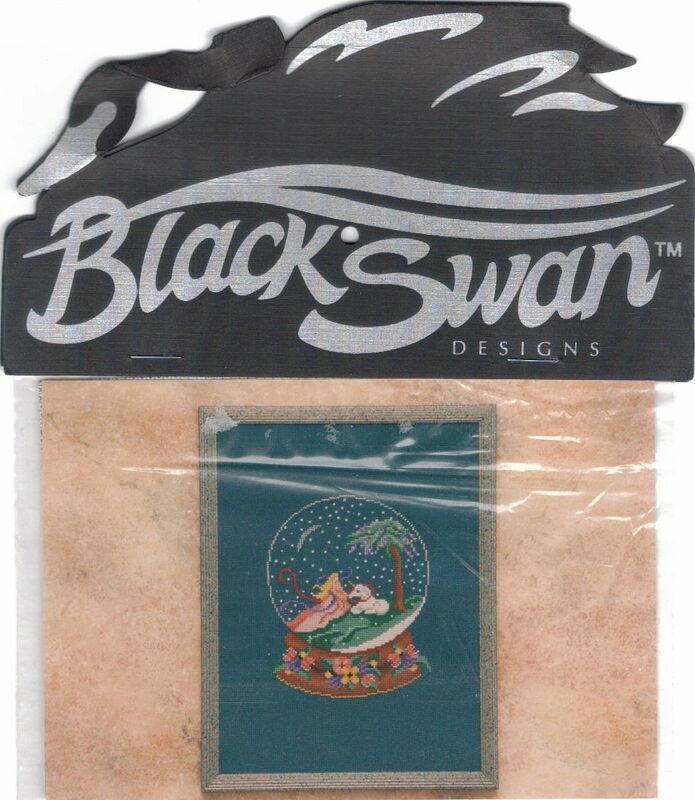 In this one I have bundled together the designs which have only been worked on for a small amount of time. The numbers represent days. The days may be of varied lengths, I don't count hours but it all evens out. Book of Spells is worked on every day but only a little bit each evening usually. Those 11 days are when I didn't stitch on anything else. Usually when I worked a full day and took it in with me for my lunchbreak stitching. Finally, I have launched the annual Summer Postcard Blog Hop. The theme this year is Pets. All you need to do is email me a photo of something you have stitched on this theme plus a little message about what pets mean to you. Once I have a few I will start emailing them to the participants who will display them on their blogs. The Blog Hop lasts all Summer so don't worry if you don't have anything suitable stitched yet. 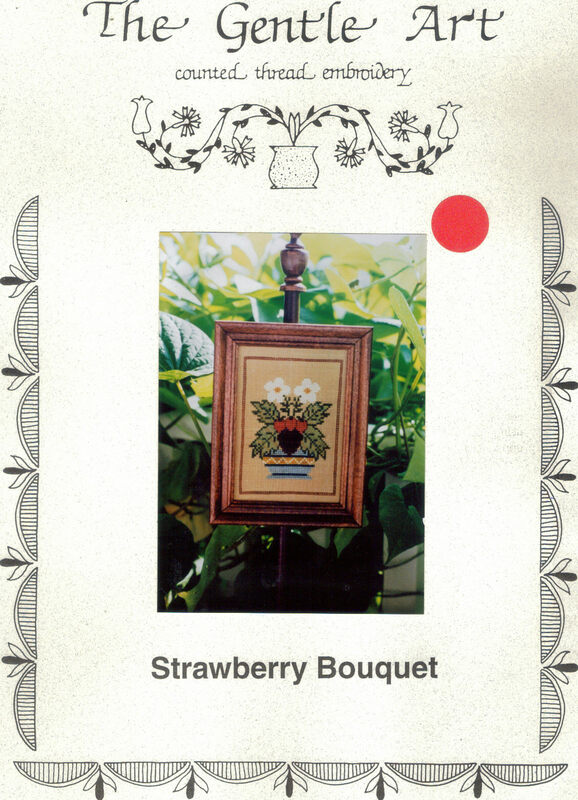 I finished the border around the rose motif and all the smaller pieces around it. I'm going to move to the top next and work left and then down. This is a Scarlet Letter design which was a gift from Nicola last Christmas. The Scarlet Letter blogs are very quiet now but all the action is taking place on the FB page if anyone is interested. I have finished all my "obligation" pieces this month for the various SALs so it was a case of "what next?" I had a little rummage through my DUCJC starts from January and chose this very unseasonal piece. It's the January Wordplay by With Thy Needle & Thread. This was a gift from Shirlee, who sadly did not enjoy the stitching process as much as I have been! And here it is now. You can see I have totally changed the colour scheme. I have converted to DMC anyway and having chosen a blue fabric I have gone for colours which go well with that. The top photo is much more true to the actual colour. 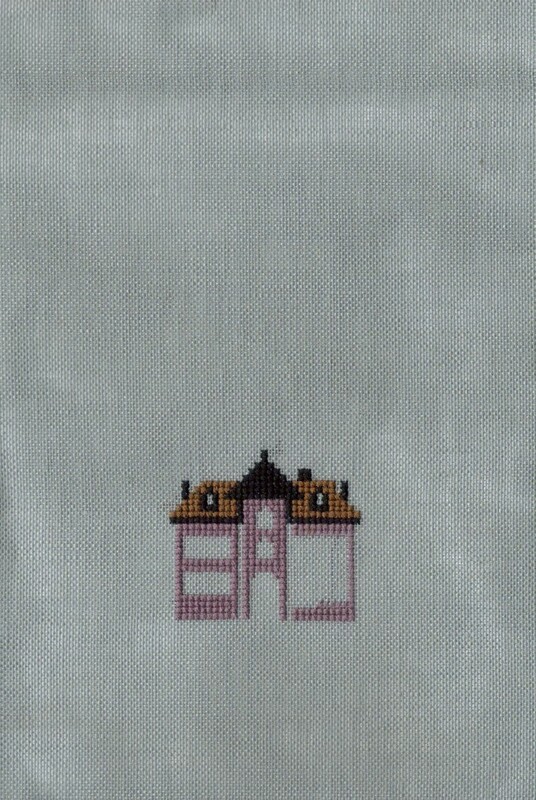 Stitched over one on 32 count Star Sapphire linen. When I was taking part in the DUCJC I photographed each piece with the cover picture as well, just so you could see what it would look like. Chiara the Grey Tail has suggested we do this all the time. Not just to show the finished piece but to prove we bought the original chart. Copyright theft is in the stitching news again following the revelation that two stitchers quite well-known (on FB at least) have been caught uploading and downloading charts to those vile Chart-Sharing Forums. 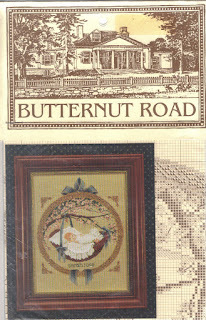 Finally, don't forget the Summer Postcard Blog Hop. The theme this year is Pets. Just send me an email with a photo of something pet themed you have stitched or otherwise crafted plus a little message about what pets mean to you. I'll pass the photos on to the next person and we'll have a nice little hop this summer. 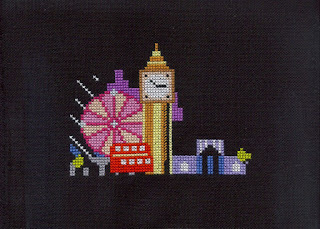 Pretty Mini London is a design by Satsuma Street which I am stitching every Tuesday as a SAL with Linda and Kate. 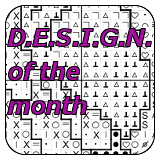 Check out their blogs for their progress on various SS designs. Finally, my Summer Postcard Blog hop again! The theme this year is Pets. All you need to do is email me a photo of something you have stitched on this theme plus a little message about what pets mean to you. Once I have a few I will start emailing them to the participants who will display them on their blogs. The Blog Hop lasts all Summer so don't worry if you don't have anything suitable stitched yet. Just leave a comment saying you would like to be involved and I will remind you later. With a serendipitous stroke of luck Gazette 94 has just released some new freebies which are cats! What are the chances of that? Look at that, a zero spend for June! However SFS has been divided into two halves this year with SFS-B starting on 1st July with the balance being zeroed. So I still have ten days to spend that £32.38 or lose it from the budget. I will keep you informed. Stitched on 28 count black evenweave. This week I worked on St. Paul's Cathedral, the big red bus, the first part of the Gherkin and some trees. We have the full height and width of the piece now. 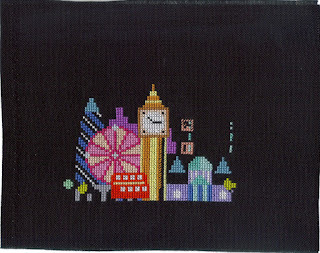 It is quite mini, 50 x 74 stitches. I'm using the recommended DMC for most of the design but I substituted 4130 for the fire. This is one of the variegated threads they produce. This one is quite subtle so I will be using it for Book of Spells too. Finally, my Summer Postcard Blog hop again! The theme this year is Pets. All you need to do is email me a photo of something you have stitched on this theme plus a little message about what pets mean to you. Once I have a few I will start emailing them to the participants who will display them on their blogs. The Blog Hop lasts all Summer so don't worry if you don't have anything suitable stitched yet. Just leave a comment saying you would like to be involved and I will remind you later. I remembered this blog today and it has a few suitable designs. You have a peacock or a chicken as a pet? Yes? 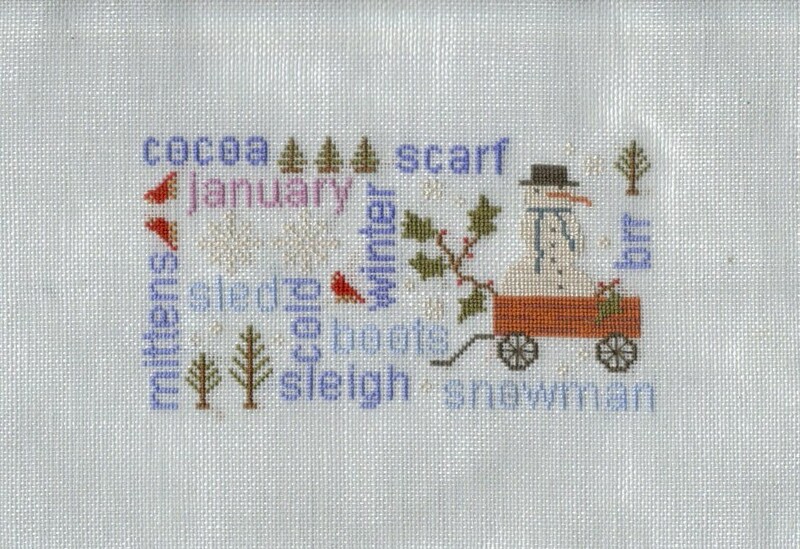 This is a Mill Hill beaded sampler called Frosted Heather Rose. I won it in a giveaway organised by Rosey of Ishkabibble. This is a nice quick stitch, provided you can set up your area in such a way that you won't be disturbed for a few hours! It is easier to bead as you go too. Now all I need is a nice little frame. I am sure I will have one in my frame stash somewhere. Finally, my Summer Postcard Blog hop again! The theme this year is Pets. All you need to do is email me a photo of something you have stitched on this theme plus a little message about what pets mean to you. Once I have a few I will start emailing them to the participants who will display them on their blogs. The Blog Hop lasts all Summer so don't worry if you don't have anything suitable stitched yet. Just leave a comment saying you would like to be involved and I will remind you later. stitched on 28 count evenweave. I am beading as I go because it is so heavily beaded it is just easier! And now over to you - Here is the place for you to link up so we can see what Gifted Gorgeousness you have been stitching so far this year. Please use your name or your blog name in the field NOT the words "June Update" so I can easily see who has linked up this month. Last month we had a GGG (Gifted Gorgeousness Giveaway) for a Shepherd's Bush chart donated by Stitching Noni. 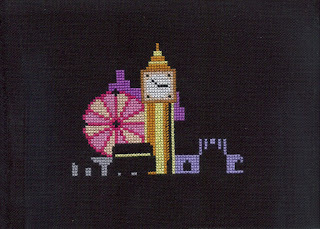 This was won by Kay from Stitching in the Country and should be winging it's way to her right now. This month we have a GGGG (Gifted Gorgeousness Giveaway by Gwen!). The lovely Gwen from Guava Gems said to me that she had some charts she'd like to donate for giveaways. I was very happy to facilitate and sent her my address. Well, an entire box arrived!! 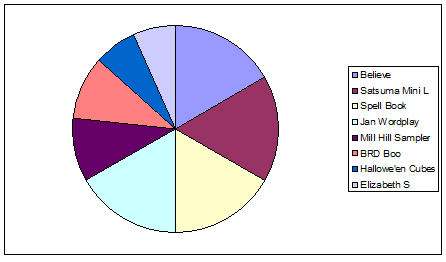 I have selected six very varied charts (because it is the sixth month of the year). There are enough charts to have giveaways all year now! All you have to do is link up for June's Gifted Gorgeousness SAL and chose one or two charts from the above list, leaving a comment below stating your choices by the end of the month. 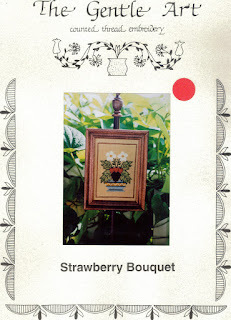 Finally, don't forget the Summer Postcard Blog Hop. Details at the bottom of the last half a dozen posts because this one is quite long enough already! Yes, we have another finish for you all! Joan Elliott's Believe, one of a series of four affirmations with the others being Hope, Dream and Imagine. I stitched this one on 28 count opalescent Robin's Egg evenweave by Silkweaver. I have enough fabric to stitch all four. I only have about six packets of Magnifica beads but by happy chance I had the one colour the chart needed! This is going to be an end-of-term gift for the Small Boy's class teacher and TAs. Because there are a mixture of girls and boys in the class I changed one fairy into a boy fairy. Sorry Linda, I stitched loads!! The light pink infill on the Eye, the lilac skyscrapers, the grey arches and the mauve of St. Paul's Cathredral. Wouldn't that make a perfect Satsuma style cross stitch? Even the colours tone. Unfortunately I forgot that the Small Boy was off school on Thursday and he does not mix well with beads! So for Thursday I thought I'd make a start on June's ornie for the Hallowe'en Ornie SAL. Despite choosing the themes myself I always forget what they are so I popped over to the blog and saw those dread words "free choice". Nooooooo, how can I possibly chose from all my Hallowe'en charts and magazines? Bit of a boring title that, hopefully the post will be more interesting! I am using DMC for this project, one strand over 2. For the moon I used 4145 which is a variegated grey. Now I have moved onto the boring border on the right, There is a much more interesting border along the bottom thankfully! Look at all those lovely charms! And some HDF silks which I have never used before. Carin's stitching is perfect, as is her sewing, you can't even see the join! The second giveaway was from Rosey from Ishkabibble. 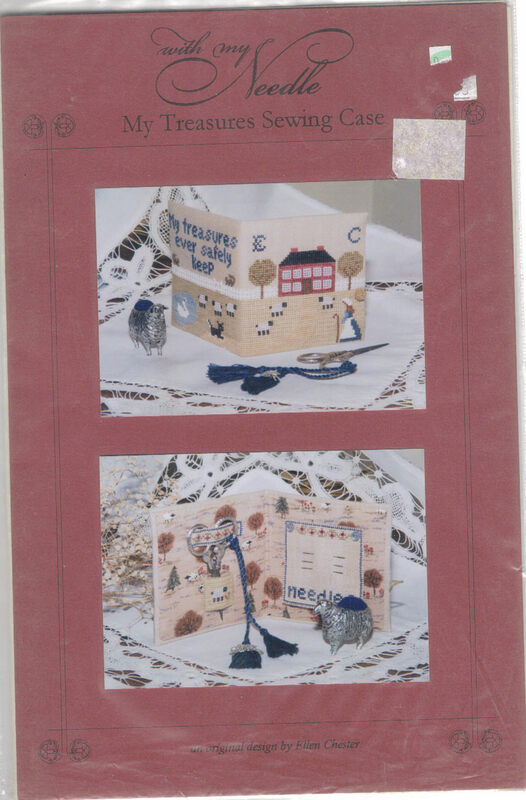 She had a Mill Hill kit complete with fabric, threads and lots of beads. This is actually quite a tiny piece but with so many beads! I wonder if anyone can identify the island shown on the postcard before reading on? Rosey spent several years in Hawaii when she was younger and came home with a special souvenir - a husband! The postcard actually shows the island of Maui. Lovely isn't it? Finally, the talk of postcards brings me onto my Summer Postcard Blog hop again! The theme this year is Pets. All you need to do is email me a photo of something you have stitched on this theme plus a little message about what pets mean to you. Once I have a few I will start emailing them to the participants who will display them on their blogs. The Blog Hop lasts all Summer so don't worry if you don't have anything suitable stitched yet. I'm going to be finding some freebies online to inspire you. Today's choice is the Guinea Pig. 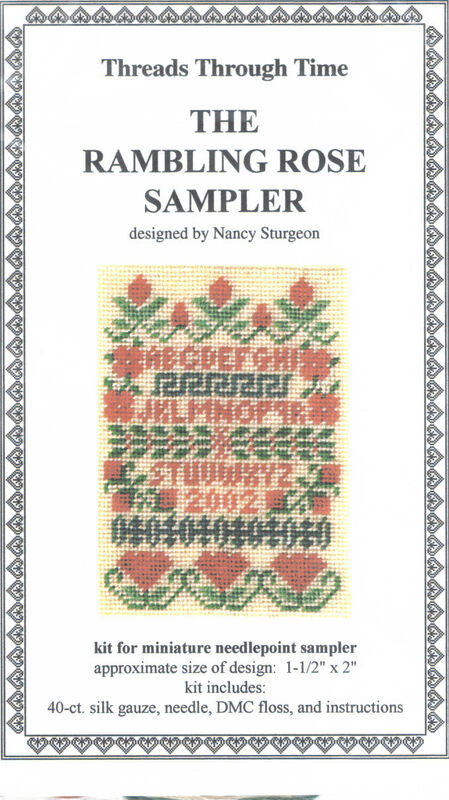 This is a versatile link because you can cross stitch or crochet the guinea pig! Over the last month I have stitched four of my 15 designs, and completed 2, which brings the total of finishes to six! The next finish was the Kingfisher which will be an end of term gift for the Small Boy's class. There are two teachers and three TAs although he only has close contact with one teacher and one TA. But it made sense to make something they can hang on the classroom wall rather than individual pieces. I'm intending to add the word KINGFISHERS on it once I have the frame chosen so I know how much space I have! 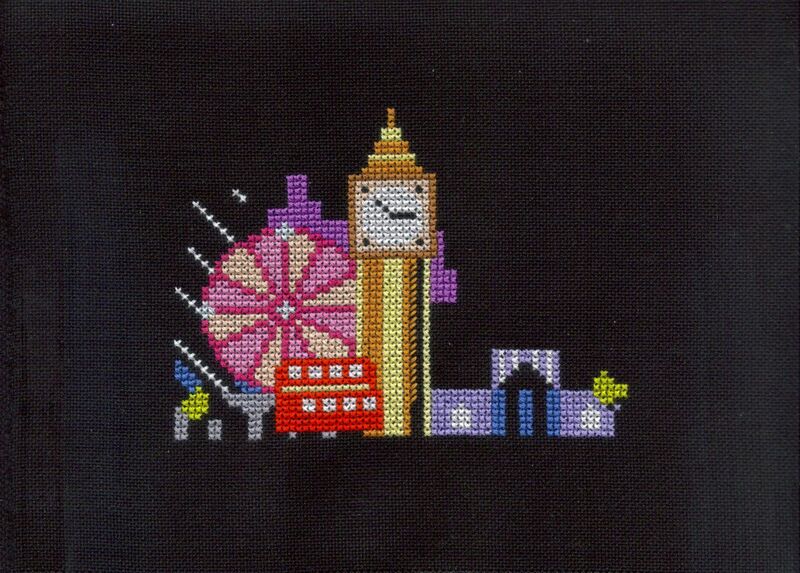 This is part of a design by Anchor which was a free gift with World of Cross Stitching magazine. It was charted in Anchor shades which I have some skeins so I used the colours where I had them and subbed DMC where I didn't. 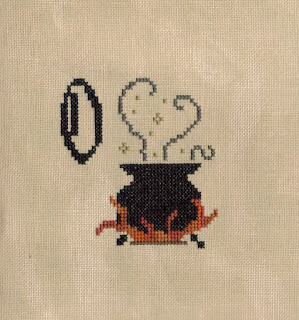 The backstitch was a pain because so many blocks were split to make the sketchy effect. This is relatively easy on evenweave but would have been awful on the recommended aida. Having completed the end of term gift for one school I thought I should continue with the gift for the other school. There is one teacher and three TAs there so a class gift is again in order. They will also get wine and biscuits/chocolates to share too. Expensive business this schooling! Thankfully the Large Boy is now at High School where the teachers get nothing except grief off the parents LOL. This is one of a set of four designs from Joan Elliott's book Bewitching Cross Stitch. I am using a 28 count opal evenweave called Robin's Egg by Silkweaver. It is big enough to stitch all four design, the others are Hope, Dream and Imagine. I like the idea of doing one for the Reception class for last year and the other two for the next two years at school. June – Do you find yourself more productive with stitching in summer or winter? Hard to say really. I don't log my actual hours stitched and a lot of finishes in one month doesn't necessarily mean more stitching. 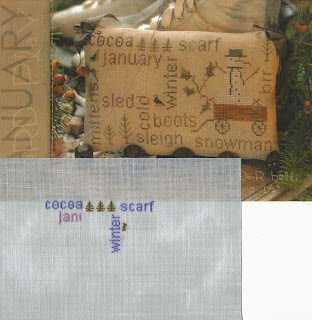 January was a good example of that, stitched madly every day and not a single finish! Work is the biggest hurdle to my stitching time. Not the full days because I take a piece in with me for lunch break but the five hour days mean it gets squeezed out in favour of all the other things I usually do during the school hours. December is the worst month because of the extra Christmas shifts combined with the extra Christmas chores and activities. School holidays are good for stitching. We get up half an hour later than usual but have the whole day to potter around. So maybe August is my best month. 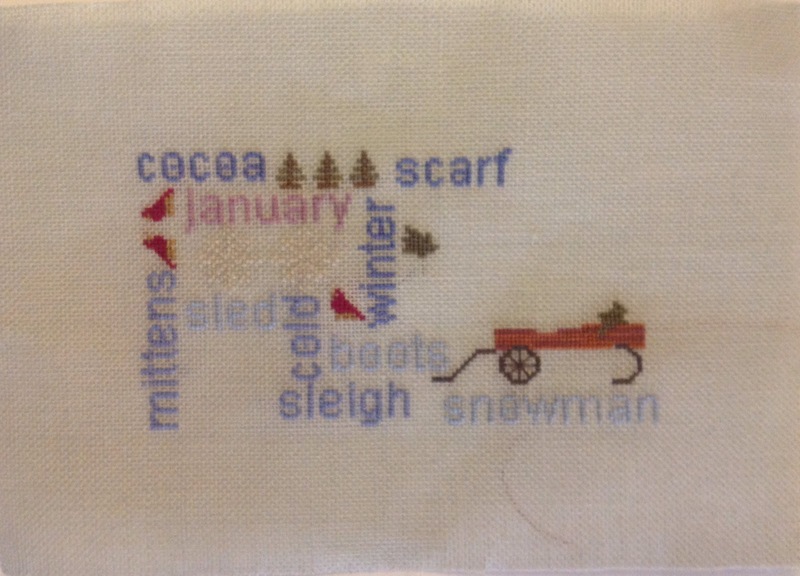 You may have noticed that the season does not affect my stitching themes! Any time is the right time for Hallowe'en. Of course my Blog Hops do reflect the seasons - Advent for Christmas, Easter in the Spring and the Summer Postcard for the Summer! Nice segue there. The theme this year is Pets. All you need to do is email me a photo of something you have stitched on this theme plus a little message about what pets mean to you. Once I have a few I will start emailing them to the participants who will display them on their blogs. The Blog Hop lasts all Summer so don't worry if you don't have anything suitable stitched yet. I'm going to be finding some freebies online to inspire you. Today I have chosen two pet bird themed freebies from Kissy Cross. She also has a lovely Christmas Budgie freebie too.